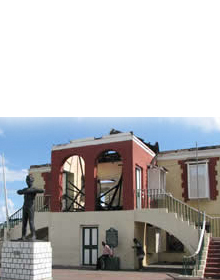 Situated between Port Henderson and Passage Fort on the seaward side is Fort Augusta in the parish of St. Catherine. Construction of the fort began in 1740 under very unusual conditions. It was built in a swamp area which had to be filled and many of the workers suffered terribly from fevers and insects. 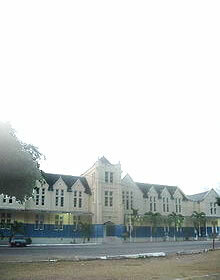 The fort was completed in the 1750s and named Fort Augusta in honour of the mother of King George III. 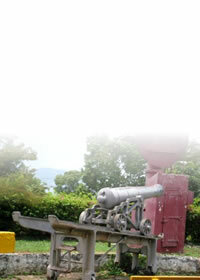 The fort was built to accommodate 80 guns to guard the western end of Kingston harbour. In 1763, the magazine with 3000 barrels of gun powder was struck by a bolt of lightning. Three hundred person were killed and windows up to 17 miles away were broken by the blast. The shocks created a crater which had to be filled before reconstruction could begin. By 1765, a new magazine was added to the fort along with a small wharf and a cistern capable of holding 7000 gallons of water. In 1768, the fort had 80 guns in excellent order and by 1770 the magazine was capable of holding 1400 barrels of gun powder. The fort is currently used as the island's only female prison.